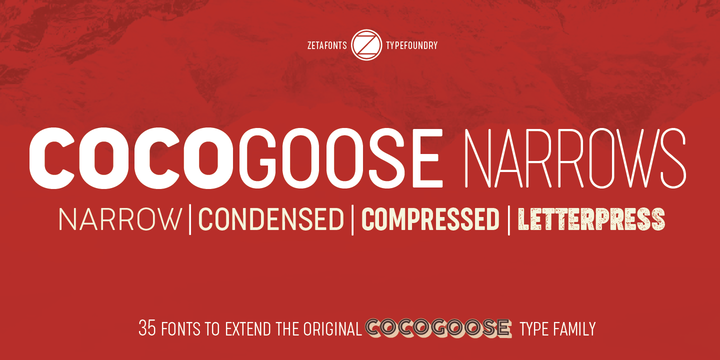 Cocogoose Narrows is a contemporary typeface created by Cosimo Lorenzo Pancini and published by Zetafonts which it comes in 35 fonts, four widths (Regular, Compressed, Condensed, Narrow) each with 7 weights (from Thin to Bold) and italics, a wide range of OpenType featureas and over 70 language support. It has design in three different narrow weights with non-repeating double letters for a realistic effect. It is perfect for display use, editorial, book, advertising, logo, packaging, poster, web and so on. Enjoy! Price: starting from $29 for one font to $190 for all 35 fonts. A font description published on Tuesday, April 3rd, 2018 in Cosimo Lorenzo Pancini, Fonts, Zetafonts by Alexandra that has 1,703 views.